Yes, the Post Office has raised rates again, effective January 27th. Priority Mail rates are up, but we have held the line on the Priority Mail Express Flat Rate Envelopes and International rates, at least for now. For more details, see our Shipping Information page. Our regular Store Hours: Monday - Friday, 7 am to 5 pm. Closed on Saturdays & Sundays. We ship via USPS Priority Mail, so be sure to provide a shipping address the Post Office delivers to. All orders under $30 automatically have a $4.50 small order handling fee added to the small flat rate box cost. See the Shipping Info page for more details. If the order amount doesn't justify the shipping expense, please don't place the order. Thank you. New Products: Tap & Toggle Bolts in 3 diameters. As of January 23rd, 2018, Priority Mail Flat Rate Shipping Costs for US addresses have risen slightly. Canadian Rates remain as they were, but all other International Rates have risen slightly. For more detail, see the Shipping Info page. We no longer offer to use UPS for expedited shipping. If you need something delivered yesterday, and it's not our fault, please don't even ask. For relatively small amounts of material (up to 8 to 10 pounds per package), we can still use Priority Mail Express Flat Rate Padded Envelopes, in multiples if needed, for expedited shipping. Delivery is either one or two day, depending on the destination. This option remains on the shipping methods menu. BlacksmithBolt.com is the supplier of choice for specialty fasteners in the Blacksmithing, Metalworking and Woodworking communities, Restoration work, and the Building Trades. 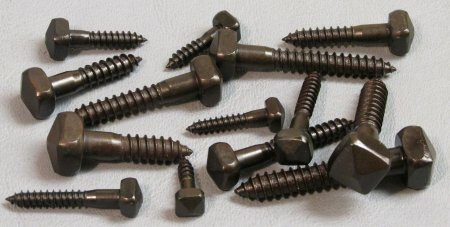 Wood Screws include the traditional head styles, Oval, Round and Flat. We have a few brass and bronze wood screws, too, and finishes on steel screws can include Plain, Black Oxide, Bronze Plate, Nickel Plate, or even Gold Plate. Among the Tools we offer are 8-Point Sockets to drive Square Head Bolt and Screws, Fuller Countersinks and Tapered Drills, our own Standard Screw Gauge, and more. Nothing ruins the appearance of a nice piece of metalwork faster than a hex-head bolt or a Phillips head screw. Accordingly, you will not find any of either one of those items here. Recognizing that the majority of blacksmiths and other metalworkers may wish to make their fasteners more than simply functional, we have chosen not to carry zinc-plated or hot-dip-galvanized fasteners. The material finish will be either plain, plain & oiled, or black oxide, in almost all instances. No one really wants to have to burn the zinc off their fasteners before re-working them. Of course, since we specialize in old-fashioned fasteners, you can also assume several additional rules, including but not limited to: No Pop-Rivets, No Torx, No Metric, and No Combo.